I had the immense good fortune Friday night of catching Tift Merritt at The Mucky Duck in Houston, where she played two full sets. Merritt resides pretty high on my list of singer-songwriters alongside folks like Joe Henry (there's a stunning live bootleg floating around out there of Tift singing Dylan's "Hard Rain's Gonna Fall" with JH accompanying her on acoustic guitar, part of a NYC I'm Not There celebration). Anyway, the shows were phenomenal, and I sat about two feet from pedal steel and guitar player Eric Heywood, who has toured and recorded with Merritt for a couple of years now. He is on a very short list of in-demand steel players who has played on many fantastic records. Since most of the music I love today sprung from that mid-1990's No Depression explosion, I must owe Heywood a cosmic debt because he played on some of my favorite records of that period (Richard Buckner's Since being chief among them). 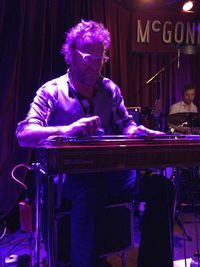 He more recently lavished some gorgeous pedal steel upon John Doe & The Sadies' Country Club, which has become an enduring favorite of mine over the past few years. After the show, Eric was kind enough to chat with me for a while, and I mentioned the blog. He is fairly deeply connected with the same circle of musicians as JH, most recently due to his recording and touring with Ray LaMontagne and The Pariah Dogs, which also includes Jay Bellerose, Jennifer Condos and Greg Leisz (though Leisz did not tour with them, to my recollection). But even I didn't realize he toured with JH during the Short Man's Room/Kindness Of The World period and recorded with him on Fireman's Wedding and Trampoline. 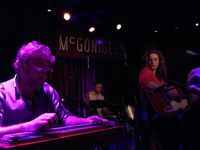 Most recently, Heywood added pedal steel to Lisa Hannigan's Passenger, appearing on the track "Safe Travels". I just wanted to give some recognition to yet another talented musician who can be counted among Joe Henry's trusted confederates. Check out this 2008 interview with Heywood from No Depression, and marvel at the sheer number of great recordings he has contributed to over the years, here and here. 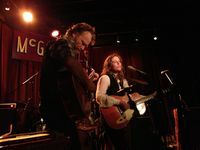 And be sure to catch Tift Merritt if she heads your way so you can check out her wonderful band for yourself. UPDATE 2/18/13: And just in case you've seen Tift Merritt with Mr. Heywood recently, and you were wondering what that beautiful Tele he plays is ("Why, yes, DK – I was wondering that. "), check out the website for Creston Guitars where his guitar has its own page. I was in Burlington, VT, last year for Grace Potter's Grand Point North music festival, and several of the local acts were outfitted with Creston guitars. Turns out Creston has followers well beyond the borders of Vermont! Please excuse the guitar geekery. Happy belated New Year to all of you! I guess 2012 seemed like a quiet year for Joe Henry fans. Though it should be noted that JH probably toured more last year – solo and with Lisa Hannigan – than he has in quite a few years. First, I should say I don't have any inside scoop on Joe Henry's upcoming schedule. However, based on his periodic Facebook postings, I think it's a safe bet that 2013 will see the release of more projects with JH's name than in 2012. Yesterday brought word that Joe's longtime friendship (and frequent collaboration schemes) with Billy Bragg will bear fruit in the form of a new Bragg album titled Tooth & Nail (due in the UK on March 18; in the US on March 19). The record was recorded early last year at Garfield House with some of the House regulars – Greg Leisz, Patrick Warren, David Piltch and Jay Bellerose. You can find all the relevant info and download the track "Handyman Blues" here. It appears also that JH is ringing in the new year with sessions for the follow-up to Hugh Laurie's very successful Let Them Talk. It seemed unthinkable to me that, after developing such an obviously fruitful template for Laurie's first album, the two would not reteam eventually. I cannot wait to hear what comes of the sessions – we already know that the legendary Taj Mahal dropped by for some recording. Normally, I would assume the new record would definitely see the light of day in 2013, but Let Them Talk was recorded over a few sessions, and Laurie probably keeps a pretty full calendar. But here's hoping sooner rather than later. In late 2012, sessions were held at Garfield House with ex-Byrd/Flying Burrito Brother Chris Hillman and T Bone Burnett in attendance. I don't know or recall what the project is, but I can't wait to find out. Finally, if you are an Over The Rhine fan, you might have noticed that they are prepping a similar fundraising campaign for their next two project, similar to what was done for The Long Surrender. I'll just selfishly hope and pray that they enlist JH to once again helm their next album. There is still a TV biopic of June Carter Cash in the works (originally due last November). My understanding is that JH produced some of the "early Carter Family years" tracks, with singer-songwriter John Doe playing the role of AP Carter. Singer Jewel Kilcher (aka Jewel) portrays June Carter Cash, but I don't believe Joe had any hand in those tracks. The Lifetime Network was set to air the movie, but it has fallen off the radar a bit. And don't forget that JH honed his acting chops in 2012, portraying a – gasp! – musician in Robert A. Borders' forthcoming Pleased To Meet Me. It's probably reasonable to expect that this film sees some kind of release in the near future. Finally, Bonnie Raitt's very successful Slipstream is up for a Best Americana Album Grammy, and I'm betting is a shoe-in for that category (which probably just jinxed it). So welcome back, and I'll keep you updated as I hear about it. If Joe's trend since 2007 holds, we'll get a new Joe Henry album sometime in late summer or early fall of this year… but that's just me speculating and maybe lobbying a bit. Joe Henry & Lisa Hannigan in Japan! This has been linked at JH's website for a couple of weeks, but if you have not watched it yet, do so immediately. Having recently wrapped up their brief North American tour together, this performance bottles a bit of the magic of the two artists' recent performances. Considering how lovely JH and Hannigan are together, here's hoping there are many more collaborations on the horizon. Joe Henry and Lisa Hannigan from The Portland Sessions on Vimeo. Joe Henry will be joining Lisa Hannigan this month for a series of dates that promises to be a unique collaboration. Read more about it in JH's own words here. The tour kicks off tomorrow night at Park West in Chicago. More dates here.